Check mate. Do you dare? Game, set and match. Not quite the rules of chess, but who needs rules? This seasons designers clearly don’t. 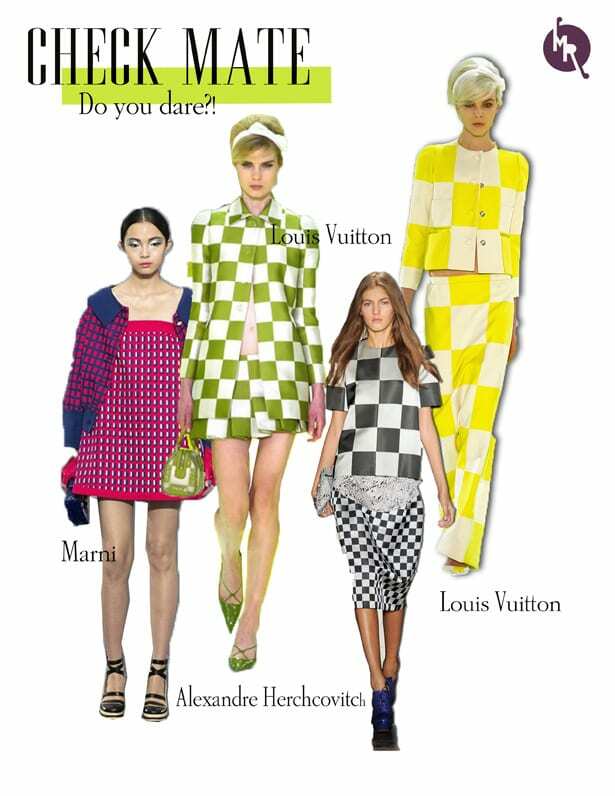 Spring/Summer 13 collections this year contained many a chequered print. Using simple clean, structured lines and contrasting with big bold square prints. It definitely has that clean 60’s vibe. Designers like Louis Vuitton and Hermes used this heavy print a lot through out their collections. Louis Vuitton used big bold prints, making the squares really stand out. Other designers like Marni used small, less obvious checks. All collections and outfit that convey the checks whether large or small, bold or minuscule, it definitely adds a chic edge to your style. Whether it being a simple scarf or an edgy pair of trouser, would you be daring enough to wear this on trend pattern?